Between 4 and 7pm seven dancers were presented. Of the noteworthy performances, one was by Sujata Mohapatra's male disciple Soumya Bose. He has been receiving training under strict supervision of Sujata and has imbibed Guru Kelucharan's bani well. The pallavi in Patadeep raga saw him executing the movements with sculpted finesse. Though tall, his body falls into beautiful postures and the resolutions of movements are clear and neat. The ashtapadi Priye Charushile for abhinaya was performed with dignity. Krishna begging Radha's forgiveness was enacted with deep feeling. Telling Radha that she is the adornment of his being, Soumya elaborated imaginatively various similes, like peacock feather, like diamond in his crown. Asking Radha to place her lotus feet on his head as a mark of total surrender was depicted effectively. Here is a male dancer who is bound to go places with his determination to carve his career as a professional dancer. Indu Kanan from Singapore presented ashtapadi Ramati Yamuna tire describing Krishna's playing on the bank of river Yamuna. 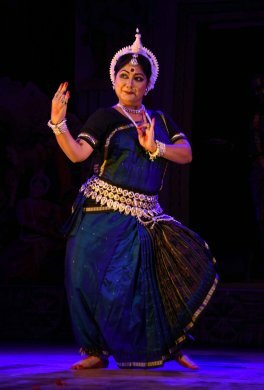 Indu Kanan has stage presence and has been performing Odissi for quite some time, runs an institution in Singapore, visits Odisha to further study Odissi under different gurus. This particular ashtapadi she has studied from Aruna Mohanty. Though she has grasped the meaning well, overall impression one got watching her was of movements generally not settling on her body. The elfin grace that is a salient feature of Odissi seemed to elude her despite performing competently. One felt that something was lacking. 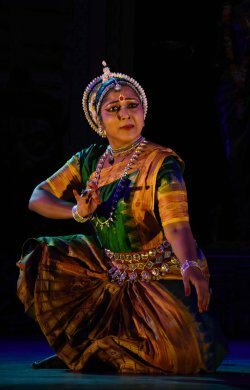 With obvious advantage of stage presence, one hopes she would make up for investing her movements with fluid grace of Odissi. The expressions demand more intensity. Under the guidance of her Gurus, from whomever she has been learning, she needs to overcome these lacuna. Young Prachi Hota is a disciple of Harekrushna Behera. However, she has studied Madhurashtakam under the guidance of Aruna Mohanty who had studied from Pankaj Charan Das. 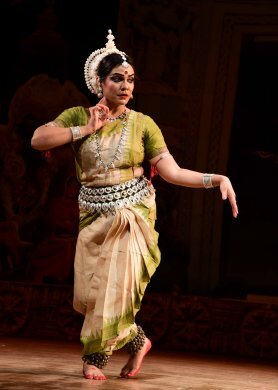 Therefore like Suhag Nalini Das, wife of Sarat Das, who had performed Madhurashtakam earlier, Prachi also reinforced the impression of Pankaj Charan Das's choreography. The sequence of Gopi madhura, gau madhura and acts of Krishna like subjugating Kaliya and killing Bakasura were enacted terming those episodes as madhura, meaning divine acts. Prachi is young and passionate about performing Odissi. With more performances and exposure she would make the grade. She has been also passionate to master the craft of film making and is planning to go to London to further study film making. She will have to learn to manage to balance these two demanding careers. Swayampragnya Sahoo presented Kunti from Panchkanya, taught to her by Durga Charan Ranbir. The other dancers who gave brief recitals included Sruti Swayamsiddha from Kolkata, Diptimayee Sahu from Bhubaneswar, and Kabita Misra from Kolkata. 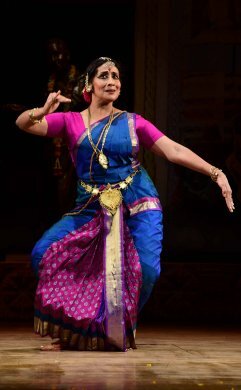 The post performances after 7pm featured Sujata Mohapatra. After offering prayer in praise of Guru and offering flowers at the feet of the statue of Guru Pankaj Charan Das, Sujata enacted abhisraika nayika with the ashtapadi Sakhi he Keshi mathanamudaram, Radha's first physical union with Krishna. 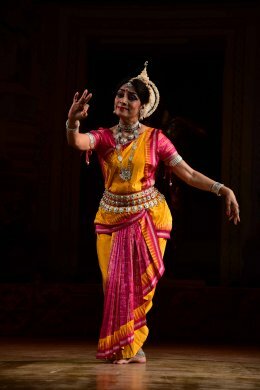 Sujata has internalized the technique of Guru Kelucharan Mohapatra so well that each time one watches her performing any of Guruji's choreographed numbers, one sees with delight that she succeeds in bringing those numbers alive, remaining faithful to Kelubabu's design and spirit. She is blessed with that ability and the nuances are enjoyable. Sujata portrayed Radha's love for Krishna, the shyness, and embrace with god with sensitivity. The musicians gave her excellent support. Sharmila Biswas from Kolkata selected from Krishnakarnamritam, the shloka in which Yashoda tells Krishna the story of Lord Rama. For this shloka, Sharmila has studied abhinaya under legendary Kalanidhi Narayanan. Krishna listens while sleeping and responds with 'Hum Hum' sound. When Yashoda tells that when Rama chased him, Maricha in guise of golden deer cried 'Lakshmana Lakshmana' and listening to it suddenly Krishna got up and asked for bow; seeing that Yashoda was taken aback. Krishna jumped as he was in previous birth avatara of Rama and forgot that he was listening to story mother Yashoda was telling. This is an exquisite poetic twist in the shloka. Sharmila's abhinaya as bewildered Yashoda was touching. With motherly love she cajoled Krishna to sleep, and once Krishna recovered from his agitated mood, Yashoda was reassured and put Krishna to sleep. One of the finest abhinaya performances by Sharmila Biswas. Pankaj Charan Das's disciple Puspita Mishra performed Ahalya from Pancha Kanya. Beginning with the shloka in praise of the five kanyas, whoever would remember them in the morning, would beget punya and achieve moksha, release. Then the story of Ahalya unfolds with her beauty. The enraged Gautam rishi when he learns about Indra in guise of Gautam having seduced her, curses her to turn into stone. But being innocent, Ahalya receives moksha when Lord Rama touches her and from stone she returns to life as Ahalya. Puspita Mishra having studied from Pankaj sir did justice to his choreography paying tribute to Pankaj Charan Das on his centenary celebrations. From Bangalore, Debaprasad Das's and Durga Charan Ranbir's disciple Leena Mohanty presented Bhramara Geet from Shrimad Bhagavatam, tenth canto. Radha admonishes Bhramara who Krishna has sent as his messenger, that there is not much difference between Krishna and the bee, Bhramara. Like bee flies from flower to flower after testing them, Krishna is no less clever, he too goes from Gopi to Gopi and forgets them. Radha tells bee not to touch with her whiskers which are besmeared with kum kum when Krishna embraced other Gopi and the garland was crushed on which the kum kum of rival woman's breasts was brushed. Radha is in unforgiving mood and tells bee that he cheated Bali and Sugriva, two brothers who were fighting and looked alike. So as Rama he asked Sugriva to wear a garland and fight again. He thus knew who was Bali and killed him. Krishna's deceitful acts are many, O bee! He in form of a Vamana dwarf cheated Bali raja asking three steps and after covering the universe, placed his foot on his head and pushed him to netherland, Patal. As a messenger, O bee, you have come to placate Krishna's guilt, but I would not forgive him for abandoning us, why even poor Lakshmi is pressing his lotus feet, being unaware of Krishna's wily ways. He even ill-treated Surpanakha when she was attracted to Lakshmana. It was not her fault. After telling all these stories she does not want the messenger go without telling her if Krishna had sent him to tell Radha that he still remembers her, his father's household affairs, maids and his cowherd boys. When would he come back and lay his scented hands on their heads? Leena performed this rare work with her own choreography with great intensity. The music was by Gopal Chandra Panda and rhythm by Banamali Maharana. The finale was recreation of Pankaj Charan Das's another group choreographic work by Yudhishthira Naik with his eight female disciples and one male dancer. They entered the stage with lamps and filled up the stage in semicircle. The singing of the song was in praise of the motherland, whose top is adorned with the peaks of Himalaya, and Ganga flows from there. The feet has ocean, to describe the beauty of motherland there are not enough words. The young dancers who performed between 3.30 and 6.30pm included Adyasha Misra, Abhipsa Bhanj, Ankita Rath, Pramila Kumari, Poulomi Chakravarti from Kolkata, and Leena Bola, disciple of Aruna Mohanty, currently residing in Singapore. These dancers presented several well-known numbers offering their tribute to Guru Pankaj Charan Das. In the main evening slot, senior dancers included Sharmila Mukerjee, a disciple of Guru Kelucharan Mohapatra from Bangalore. She had studied the item of Draupadi from Panch Kanya under Sarat Das. She performed to recorded music. With her mobile visage and expressive abhinaya, she succeeded in portraying Draupadi's character. The choreography followed what other dancers also performed Draupadi as choreographed by Pankaj Charan Das and further embellished by Sarat Das. 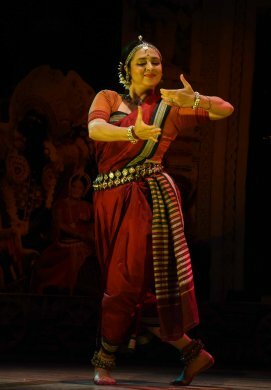 Since Sharmila has also received Mahari Award, she selected to perform Pankaj Charan Das's choreography. 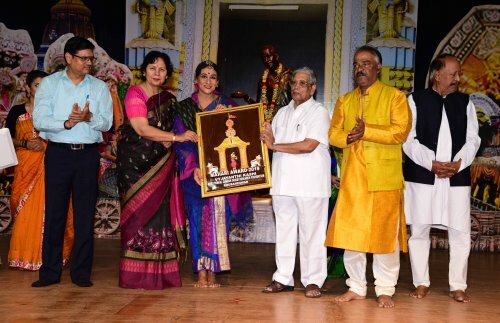 Geeta Mahalik chose to present Bhavayami Raghuramam of Swati Tirunal, choreographed by her. A senior and a mature dancer with considerable experience of performing for more than forty years, she brought to the unfolding of Ramayana story dwelling upon key incidents like lifting the bow of Lord Shiva by Rama and marrying Sita, Ravana's kidnapping Sita when Maricha came in guise of golden deer, the setubandha by monkeys, duel between Ravana and Rama, and Rama and Sita's returning to Ayodhya. Her performance was full of devotion and in keeping with her reputation as an ace performer. Meera Das, disciple of Guru Kelucharan Mohapatra, from Cuttack has earned fame as a brilliant dancer. She selected a composition Srirama Preyasi of Gopinath Panda. The music composition was by Srinibas Satpathy and Rajen Lenka. Set to ragamalika and talamalika it highlighted the love of Hanuman, a devotee of Lord Rama. Visiting Ashoka vatika where Sita was kept captive in Lanka by Ravana, he assures Sita that he has not come to harass her but as a servant of Rama, he has brought message from him and gives Rama's ring to her. Sita is overwhelmed seeing his devotion and enquires about how he is. She gives her mathaamani, head ornament to Hanuman who keeps it carefully with him and tells her that soon Rama will come and rescue her. Chanting Rama's praise Hanuman offers his pranams to Lord Rama. Meera enacted the role with deep understanding and dignity. The musicians gave her excellent support. 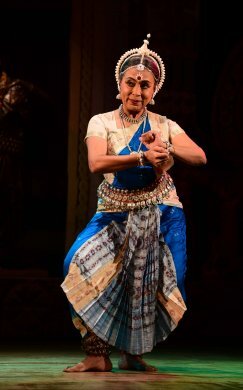 Here is a dancer who follows tradition with fidelity and keeps the standard of Odissi high. Anjana Jha, a disciple of Rajendra Gangani, is a professor and head of Kathak at Maharaja Tomar Singh College at Gwalior. She presented items from Jaipur gharana. Beginning with prayer in Malkauns raga, she established her credentials as a Jaipur gharana exponent in a trice. The footwork and chakkars, pirouettes were flawless. Her nritta was sparkling. The infra forms like parans were woven artistically in her exposition. The palta, taking chakkars on one foot, ekapada bhramari were in keeping with the Jaipur gharana technique. She concluded with a bhajan of Surdas. Tilak mala manohar, shir para chhatra dhare, with adornment on forehead and garland with canopy on the god, Suradas says who can without a Guru show the path? Only Guru saves devotees from the ocean of life. The devotional mood was well maintained. She is a competent Kathak exponent, carrying on the tradition in Gwalior. The finale Om Namah Shivaya choreographed by Pankaj Charan Das was recreated by dancers of Nrutya Bilas of Guru Braj Kishore Muduli. The iconic image of Lord Shiva, in his tandava pose, with garlands and serpents as his adornment et al highlighted Guruji's choreography. Lord Shiva as Nilakanth, when he drank poison which came from churning of the ocean was choreographed imaginatively. The dancers performed with enthusiasm. This was a marathon festival extending on 5th day with participation of stars like Ranjana Gauhar, Jhelum Paranjape, Jyoti Raut and Kuchipudi dancer Vyjayanthi Kashi from Bangalore. She was honored with Mahari award this year for her outstanding contribution to dance. I left on the 5th day for my other engagement. Therefore I could not watch these senior artists and other young dancers. I must also confess that watching 7 young dancers followed by four senior dancers and group work of Guru Pankaj Charan Das daily from 3.30 to 11pm in the night was exhausting. It would be exhausting for any dance enthusiast and a critic. Since so many dancers in order to give them a platform were scheduled, one could see that the standard in general was below standard. Sarat Das meant well and during the centenary celebrations he honoured majority of artists associated with Guru Pankaj Charan Das and also from young generation, promoting Odissi in general, but the scale of the festival was ambitious and exhausting. One appreciated Sarat Das's Herculean efforts to revive Adi Guru Pankaj Charan Das's bani; one feels sad that there are only a few artists who follow his creations. Ritha Devi has passed away. Ratna Roy perhaps has all the recordings and can teach dancers whenever she can come to Bhubaneswar. On account of her college duties she could not come. Guruji's daughter Vijaylakshmi has retired from teaching at Nalco supported school. She does not see eye to eye with her brother Sarat Das. If the family members do not reconcile, then there is little hope of Pankaj Charan Das's legacy to continue. I firmly believe that artists of Odisha need to come forward to save the legacy of Pankaj Charan Das. 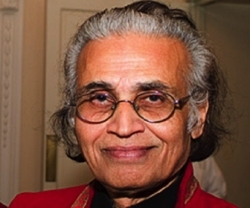 Central Sangeet Natak Akademi has recorded his abhinaya and few numbers during an extensive interview with Priyambada Mohanty. GKCM Odissi Research Centre has few recordings which should be digitalized. If Yamini Krishnamurty has some recordings of Panchakanya, and Sumathy Kaushal in USA has, they should be collected and studied and some workable repertoire should be created. Shyamhari Chakra should find time from his several Odissi dance festivals and complete the book on Pankaj Charan Das. One final observation. Like in Chennai there are performances daily of Bharatanatyam, in Bhubaneswar there are performances of Odissi daily. It may be considered as popularity of Odissi form on par with other dance forms like Kathak and Kuchipudi, but now there are signals that the standards are falling. Unless serious attempts are made by those concerned, Odissi will face problem of low standards and the recovery will become difficult. Currently in Bhubaneswar, Ratikant Mohapatra's Srjan, Aruna Mohanty, Meera Das, Guru Durga Charan Ranbir, Guru Bichitrananda Swain, Lingaraj Pradhan, Ileana Citaristi maintain high standards. Outside in Delhi, Madhavi Mudgal, Ranjana Gauhar, in Bangalore Madhulita Mohapatra, Sarita Mishra and of course Nrityagram are maintaining high standards. But in Bhubaneswar, the capital of Odisha, the mushroom growth of Odissi schools cause worry. After learning few items the young dancers open schools with several branches professing training in Odissi, which is a sorry state of affairs. One hopes senior performers who are now present day gurus would take note of this and see that high standards are maintained. 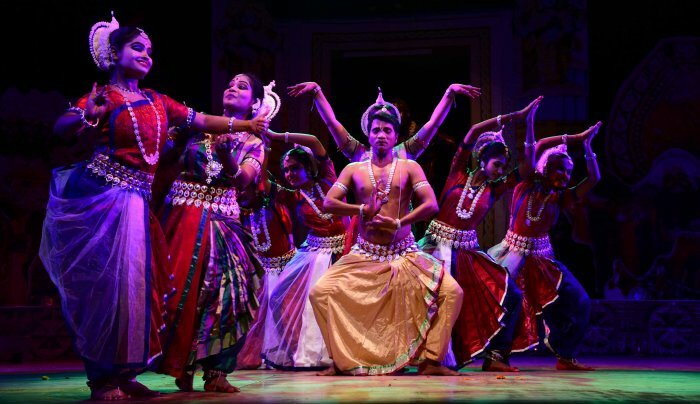 The concern you have expressed about the falling standard of Odissi dance, is shared by many of us, dancers and rasikas. In my opinion, if we have so many festivals for Odissi dance, most of them several days long, year after year, mediocrity and lack of real interest are inevitable. We have plenty of enthusiastic dancers, but a handful of dedicated and talented dancers who can be called professionals, or who would carry the legacy forward. The festivals are for the professionals and for exceptionally talented young dancers, who are already committed to dance. In my opinion, number of festivals, and duration of each should be reduced, drastically. The artistes’ selection should be strictly on the basis of merit, not with the view of giving chance to all, and filling up slots. Excellence can only be nurtured by sensitive and objective decisions from the organisers. Less is always more. We dancers, critics and organisers should have a seminar and try to solve the problem. I agree with you and share the same concern.... How to address this issue? Should there be a national seminar and interaction session with performers, teachers, organizers, scholars as stake holders?